PerkinElmer introduces the Opera(R) Phenix, a next generation confocal high content screening system that is designed to reliably discriminate phenotypes of complex cellular models, such as primary cells and 3D microtissue, which are more indicative of human biology. The system’s patented Synchony(TM) Optics control excitation to eliminate unwanted crosstalk in the sample, resulting in better sensitivity but without compromising speed. PerkinElmer introduces the JANUS(R) chemagic automated nucleic acid workstation that offers high throughput DNA and RNA extraction with four times the yield and twice the throughput of alternate technologies. A fully integrated system, this workstation combines best-in-class magnetic bead nucleic acid isolation technology with a fully-supported automated liquid handler to rapidly accelerate the extraction process. PerkinElmer Inc., a global leader focused on the health and safety of people and the environment, will introduce several novel products at the third Annual Society for Laboratory Automation and Screening (SLAS) Conference (#SLAS2014) in San Diego, January 18-22, including the Opera® Phenix™ high content screening system, JANUS® chemagic nucleic acid workstation (Booth #1005). Opera® Phenix, a next generation confocal high content screening system, is designed to reliably discriminate phenotypes of complex cellular models, such as primary cells and 3D microtissue, which are more indicative of human biology. Accurate, reliable characterization of cellular processes can further scientists’ understanding of cancer cell morphology and therefore the development of targeted cancer treatments. The system’s patented Synchony™ Optics control excitation to eliminate unwanted crosstalk in the sample, resulting in better sensitivity but without compromising speed. Data generated using the Phenix® imaging system can be processed seamlessly with PerkinElmer’s Harmony® High Content Imaging and Analysis Software, an intuitive workflow-based interface optimized for processing large volumes of data. 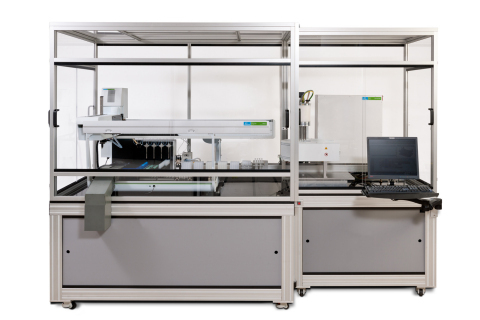 The JANUS® chemagic automated nucleic acid workstation offers high throughput DNA and RNA extraction with four times the yield and twice the throughput of alternate technologies. A fully integrated system, this workstation combines best-in-class magnetic bead nucleic acid isolation technology with a fully-supported automated liquid handler to rapidly accelerate the extraction process. Standardized protocols are designed for volume ranges of 10µl up to 4mL, resulting in reproducible, high throughput extraction from a variety of blood input sample types for downstream processing including PCR/qPCR, Sanger or next gen sequencing, microarrays and genotyping. Dedicated AlphaLISA® immunoassay kits for isotyping human and mouse antibodies provide high specificity and low cross-reactivity between isotypes, without compromising sensitivity or throughput. AlphaLISA kits for cell-based epigenetic ubiquitination which enable scientists to fully validate the mechanism of action of drugs thought to act on methyltransferase (eg. EZH2) or demethylase (eg. JMJD2A, JMJD3) enzymes in cell-based assays by testing their capacity to modulate H2a ubiquitination. These kits allow considerable time-savings over Enzyme-linked immunosorbent assay (ELISA) technology, commonly used to perform immunoassays. The above products are for research use only and not for use in diagnostic procedures. SciStream™, new software enabling the easy import of plate-based and other forms of instrument data into the TIBCO Spotfire® Analytics and Visualization Platform. SciStream unlocks the power of TIBCO Spotfire software for users of plate readers, high content imaging systems and other instruments, enabling researchers to easily and dynamically visualize their experimental data, metadata and plate layouts with unprecedented speed and interactivity. Faster visualization and analysis in TIBCO Spotfire software leads to scientific insights much more quickly than using traditional tools for assay development as well as large screening campaigns. PerkinElmer, Inc. is a global leader focused on improving the health and safety of people and the environment. The Company reported revenue of approximately $2.1 billion in 2012, has about 7,600 employees serving customers in more than 150 countries, and is a component of the S&P 500 Index. Additional information is available through 1-877-PKI-NYSE, or at www.perkinelmer.com.